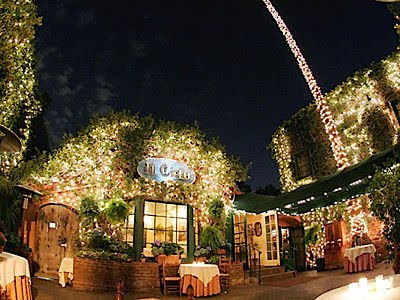 Over the weekend, I enjoyed a lunch with friends at Il Cielo (meaning "The Sky"), a delicious Italian restaurant in Beverly Hills. I've been wanting to try it ever since a friend came back raving about her Linguine alle Vongole. I'm not too keen on clams, but her enthusiasm was contagious! Although the weather was a bit chilly, we made the little journey and it was well worth it! The Focaccia alle Erbe con Mozzarella, Pomodoro e BasilicoLinguine alle Vongole (a grilled sandwich with homemade herb focaaccia, tomato, mozzarella and basil) was possibly the best thing I've ever eaten! What is your favorite delectable sandwich? I'll definitely have to make a stop here soon. Loving how cozy and quaint it looks from the picture. I basically like anything with avocado and cheese. Well...I like French dips too. What a gorgeous restaurant! I wish any of the blogs I read were from my area so I could actually check these places out. Oh, I love this place! I've only been there for dinner, so I haven't hade their sandwiches, but the atmosphere and food is wonderful! !